This penthouse is in a brand new condominium complex. The two bedrooms have king size bed. One bed is adjustable and make great massage. One interior parking space is included. It's in the urban city life while being steps away from old Quebec and all events and attractions of beautiful Quebec City. There is a large private outside terrasse with a BBQ. There is also a public terrasse and a gym on the same level Our condo is a great place to stay! Enjoyed the private terrasse or rooftop deck, a fully equipped gym, complimentary Nespresso coffee, Air Conditioning, Wifi internet, cable tv, washer and dryer and much more! We own and operate our condo. We make sure you'll have everything you may need. The condo is always kept super clean, I know how important this is! I welcome any questions. I own another condo for many years, I invite you to visit it on Airbnb, it has great reviews. 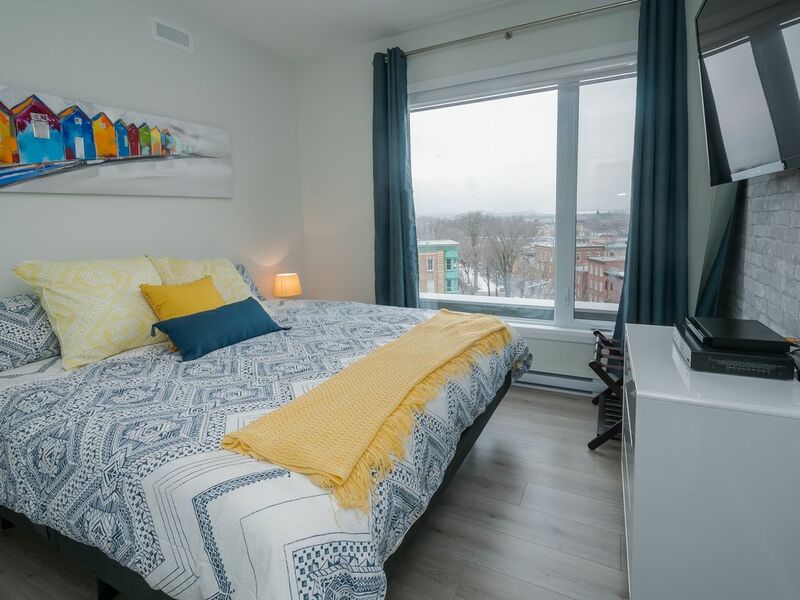 The condo is located in the St-Roch district of Quebec City. Hip and vibrant, many restaurants, bar and shopping along rue Saint Joseph. The Grocery store across the street! The condo is also at walking distance to everything! Fortifications, Chateau Frontenac, Old-port, art galleries, Convention center, train station, and all major events being held in the city. The largest toy store is just steps away! Minimum age 25 years old. Most residents of our community are owner/residents. You will find it to be a quiet relaxing atmosphere. We ask you to be respectful of the community around you. No party is allowed and no music allowed after 10 PM. The condo can accommodate a maximum of 6 peoples. Provincial (9.5%) and Federal (5%), 3.5% occupancy taxes are included in the price, we will repay the governments. Brand new apartament! Clean ... perfect! I would like to rent it again ! The condo has everything you need, was in great condition and so conveniently located. We walked to breakfast, could have walked to Oldtown but it’s a climb, parking space was super easy. Access to major roads if you plan to explore outside the city are straight shots. And we recommend you do, Montmorency Falls are a great outside activity, then head north, delightful villages and beautiful water views. We traveled about 2.5 hours north. Perfect! This property is very clean. Beds were comfortable. Beautiful view from every window. Was great having the secured parking garage. Would definitely rent again. My only suggestion would be for the owner to have some information on hand for guests such as fire company, hospital, taxi phone numbers and tourist information. Clean, modern, great location away from the crowds but close enough to walk to town. Located in its own neighborhood that has restaurants, shopping and dining. Condo itself has everything you need. Wish they were all this nice!